Four of Wajda's works (The Promised Land, The Maids of Wilko, Man of Iron, and Katyn) have been nominated for an Academy Award (Oscar) for best foreign language film. 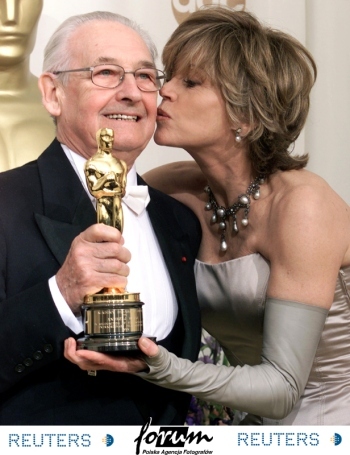 In 2000, Wajda received an honorary Oscar from the Academy of Motion Picture Arts and Sciences. I will speak in Polish because I want to say what I think and feel and I always thought and felt in Polish. I accept this greeat honor not as a personal tribute, but as a tribute to all of Polish cinema. The subject of many of our films was the war, the atrocities of Nazism and the tragedies brought by communism. This is why today I thank the American friends of Poland and my compatriots for helping my country rejoin the family of democratic nations, rejoin the Western civilizations, its institutions and security structures. My fervent hope is that the only flames people will encounter will be the great passions of the heart-love, gratitude and solidarity. On April 2, 2000, Andrzej Wajda donated his Oscar statuette to the Muzeum of Jagiellonian University in Cracow. The statuette will be exposed together with earlier Wajda's gifts: La Palme d'Or from Cannes and Golden Lion from Venice.